Chances are, if you're a blogger, or a reader, or if you sometimes look at Facebook, or Twitter, or Pinterest, you've seen some recent talk about bloggers having their work stolen by "scraper sites." These scraper sites steal blog content and repost it on their own sites, using the clicks they get to earn ad money. It's really stinky. I haven't dealt with it in several years (knock on keyboard), but many of my favorite blogs are having to change the way they publish their content through email and online reader systems. Between content stealers, and seeing people leave mean comments on other blogs, and watching people take advantage of link parties, and being overwhelmed with the start of the school year and being sick this week and not feeling at all creative...I had to sit down last night and remember some of the awesome things about blogging. It doesn't hurt that I get to try out neat stuff from companies I've always admired (hi, Martha Stewart), and I love having a spot to share my own creative projects. It's nice to get feedback from the five people who read this blog! Something even cooler and more unexpected is that as a blogger, I get to make connections with people I otherwise might not have ever gotten to know! This happened most recently when Erin from His and Hers emailed me to let me know she was cleaning out some of her things and wondered if my girls might like some of her old American Girl and Barbie stuff. 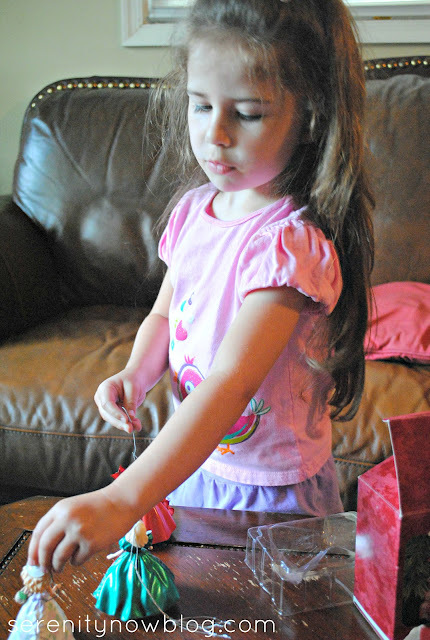 She knew they are both really into their girlie toys and offered to pop a box in the mail to Virginia. Never one to turn down an opportunity to occupy my kids with something other than begging me for cartoons, I said yes. And what do you know, a box arrived on our front stoop not too long afterwards, and the girls were overjoyed. I couldn't get over how sweet Erin was to think of us, out of all the people she might have given those fun books and activities to. This is where I have to pause and smile and remember that even though there are stinky people out there who steal blog posts and ideas and leave ugly comments...there are many more who visit blogs to be a source of encouragement, who think of others, who send boxes from other states because they know it will brighten the day of two little girls. So, thanks, Erin, for making me smile (and the girls too). And thanks to you, reader, for putting up with a non-crafty-homey-recipe post today. Sometimes it's good to remember the nice side of blogging. What's your favorite thing about blogging or reading blogs? this is why I blog- I love the goodness in peoples hearts. Hope your girls enjoy their new dolls! Don't give up blogging! I love to read your post. 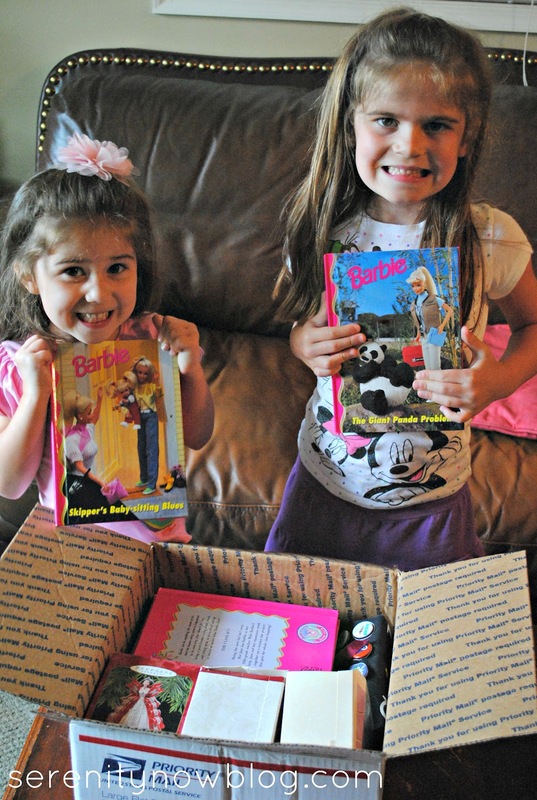 love the community of women in blogging :) And I LOVE that she sent your girls those toys - so sweet!! How wonderful! Your girls probably thought it was Christmas in August (: I blog mainly just for me, but it's nice to share what we love to do - raising families and making our homes cozy and beautiful. This is a great post! Not everything has to be crafty, I like how you keep it real. Thanks for sharing your good experiences, I am new to the blogosphere and posts like this keep me going. Thanks for such a nice post. I am new to blogging, and this is so nice to read. Restores my faith in humanity. How nice of Erin to send you those special little surprises to you and your girls. Yes, Amanda! There are so many good things about blogging. Now that so many of us use blogging as a source of income, I suppose it's inevitable that bad behavior would erupt--sad, but true. But there are so many nice people out there and I love the way the blogosphere has brought us together. Thank you for celebrating the good. Great post Amanda! There are definitely more positives to blogging than negatives. I like the connecting with others part, too. That was soo sweet of Erin to send your girls all those things. How fun for them to open! Love this post! Thanks for the smile today lady! That was so sweet of her! I love the network of friends that is made while blogging. I enjoy seeing what everyone is up every morning when I read the latest posts. I would like to know more about how to know if your content is being stolen though. I hope this never happens to me but if it does I have no way of knowing. And your girls are darling!! I was a Barbie lover too. 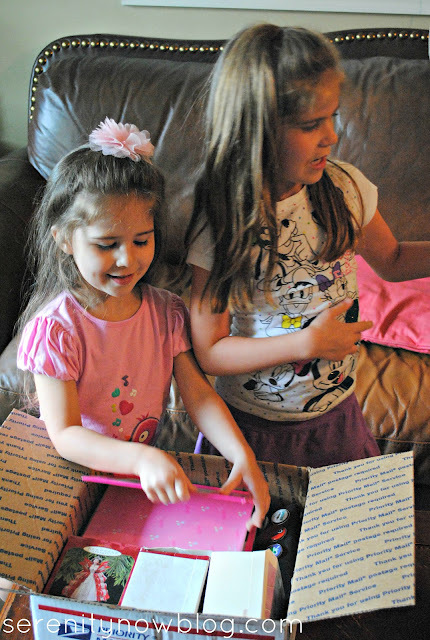 How lucky for your daughters to receive goodies from a blogging friend! I agree - focus on the positive! That is so nice!!! there are so many great things about blogging...I can't even imagine not being part of this community now! No, thank YOU for putting a smile on my face today Amanda! I can't believe people have the nerve to actually steal BLOG CONtENt when they know that the person they steal from can EASILY SEE IT!!!! I hope I never encounter that kind of situation, or nasty remarks as well. I'm so glad you don't have to truncate your posts! I think I'm going to have to start reading less blogs because I do so much of my reading through Reader on my phone, and clicking over just won't work that way. Not to mention my internet is too slow to be able to open multiple blogs at once. Thanks for writing a positive post, and for always being real with your readers! What a sweet thing for Erin to do. I agree, I love connecting with other bloggers, even if I haven't met them in real life. I've been reading your blog for over a year now, but I don't think I have ever commented. I'm constantly getting inspired and motivated by reading your words. I love the pictures you post of your girls, and all the cute and funny stories you share. You're an amazing blogger and you will always have more good than bad because of your heart. Don't let others bring you down - at least not for long. That is so sweet! What a thoughtful person. The vast majority of folks I meet through blogging are awesome, it's just unfortunate that the "bad seeds" try to ruin it. Yes, a lot has been going on lately in the blog world, but this sort of kindness really is what it is all about!! We meet the most amazing people, make friends, learn new tips and get inspiration. But what Erin did for your daughters is above & beyond what you normally see. How sweet she is for thinking about your girls! What a nice thing for Erin to do! Your girls are going to spend hours and hours enjoying their new things.